Summary: A new study reports some aspects of autism spectrum disorders are linked to defects in how peripheral nerves communicate sensory information to the brain. Autism spectrum disorders (ASDs) are characterized by impaired social interactions and repetitive behaviors, often accompanied by abnormal reactions to sensory stimuli. ASD is generally thought to be caused by deficits in brain development, but a study in mice, published June 9 in Cell, now suggests that at least some aspects of the disorder–including how touch is perceived, anxiety, and social abnormalities–are linked to defects in another area of the nervous system, the peripheral nerves found throughout the limbs, digits, and other parts of the body that communicate sensory information to the brain. The investigators are now looking for approaches that might turn the “volume” back down to normal levels in the peripheral sensory neurons, including both genetic and pharmaceutical approaches. NeuroscienceNews.com image is credited to Ginty et al./Cell. In the new study, the researchers examined the effects of gene mutations known to be associated with ASD in humans. In particular, they focused on Mecp2, which causes Rett syndrome, a disorder that is often associated with ASD, and Gabrb3, which also is implicated in ASD. They looked at two other genes connected to ASD-like behaviors as well. These genes are believed to be essential for the normal function of nerve cells, and previous studies have linked these mutations to problems with synaptic function–how neurons communicate with each other. The investigators measured how the mice reacted to touch stimuli, such as a light puff of air on their backs, and tested whether they could discriminate between objects with different textures. Mice with ASD gene mutations in only their sensory neurons exhibited heightened sensitivity to touch stimuli and were unable to discriminate between textures. The transmission of neural impulses between the touch-sensitive neurons in the skin and the spinal cord neurons that relay touch signals to the brain was also abnormal. Together, these results show that mice with ASD-associated gene mutations have deficits in tactile perception. “A key aspect of this work is that we’ve shown that a tactile, somatosensory dysfunction contributes to behavioral deficits, something that hasn’t been seen before,” Ginty says. “In this case, that deficit is anxiety and problems with social interactions.” How problems with processing the sense of touch lead to anxiety and social problems isn’t clear at this point, however. “Based on our findings, we think mice with these ASD-associated gene mutations have a major defect in the ‘volume switch’ in their peripheral sensory neurons,” says first author Lauren Orefice, a postdoctoral fellow in Ginty’s lab. Essentially, she says, the volume is turned up all the way in these neurons, leading the animals to feel touch at an exaggerated, heightened level. “We think it works the same way in humans with ASD,” Ginty adds. The investigators are now looking for approaches that might turn the “volume” back down to normal levels in the peripheral sensory neurons, including both genetic and pharmaceutical approaches. Funding: This study was supported by a Hearst Postdoctoral Fellowship; a SFARI Pilot Award from the Simons Foundation; and NIH grants T32 NS007484-14, DE022750, and NS34814. David Ginty is an investigator of the Howard Hughes Medical Institute. Image Source: This NeuroscienceNews.com image is credited to Ginty et al./Cell. Cell Press. “Autism is Not Just a Disease of the Brain: Mouse Study.” NeuroscienceNews. NeuroscienceNews, 8 June 2016. Cell Press. “Autism is Not Just a Disease of the Brain: Mouse Study.” http://neurosciencenews.com/autism-anxiety-neuroscience-4421/ (accessed June 8, 2016). Patients with autism spectrum disorders (ASDs) commonly experience aberrant tactile sensitivity, yet the neural alterations underlying somatosensory dysfunction and the extent to which tactile deficits contribute to ASD characteristics are unknown. We report that mice harboring mutations in Mecp2, Gabrb3, Shank3, and Fmr1 genes associated with ASDs in humans exhibit altered tactile discrimination and hypersensitivity to gentle touch. 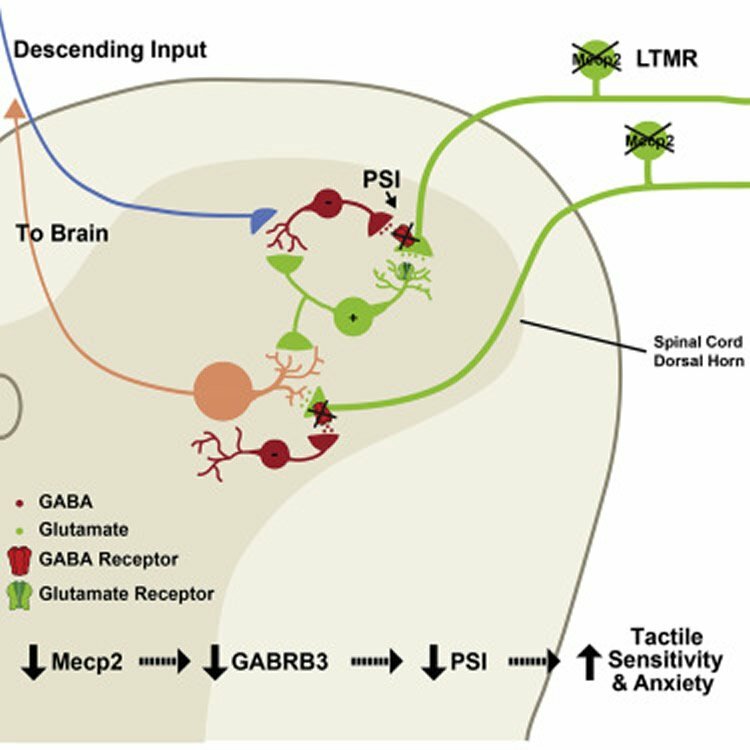 Deletion of Mecp2 or Gabrb3 in peripheral somatosensory neurons causes mechanosensory dysfunction through loss of GABAA receptor-mediated presynaptic inhibition of inputs to the CNS. Remarkably, tactile defects resulting from Mecp2 or Gabrb3 deletion in somatosensory neurons during development, but not in adulthood, cause social interaction deficits and anxiety-like behavior. Restoring Mecp2 expression exclusively in the somatosensory neurons of Mecp2-null mice rescues tactile sensitivity, anxiety-like behavior, and social interaction deficits, but not lethality, memory, or motor deficits. Thus, mechanosensory processing defects contribute to anxiety-like behavior and social interaction deficits in ASD mouse models. Asperger’s Syndrome is described as a clear of a forest where photonic energy is distributed more or less evenly across the base. The canopy reveals flourishing and the peaks represent capabilities or intelligences in the brain. What is interesting is the notion of such monokaryotic telemetry through the abundance of horizontal transfers of successive light management. Hyphae components are so economical. The extended substance entails a certain quotient of durability. Like the clearing of a forest we can observe the biological implicates of life. Lode teaches us to flay the self, anyway.